There are really easy ways to create some strong interesting lines on Dominant chords. In fact using the diminished scale allows us to use 4 different Dominant arpeggios over one chord. In this video I will demonstrate how and give you some examples! The diminished scale is very useful for improvising over a dom7th chords that resolve. In Example 1 you have the octatonic or diminished scale that is associated with G7. As you may or may not know the diminished scale is constructed by two diminished arpeggios a half step apart. In this case: Bb and B dim. If we take the B dim and play that in inversions we get the first line of example 2. For each inversion we can take the first note and lower it a half step. This gives us for dominant chords: Bb7, Db7, E7 and G7. Since we are going to be using these arpeggios to make lines it makes sense to practice them together. One way of doing this is to spend time playing the arpeggios and going from one to the next and using inversions. One way of working a bit free form on this is doing an exercise like I do in the video. Here I am just improvising in 8th note and connecting the arpeggios in inversion to help associate them with one another. This makes it a lot easier to come up with lines. For me it is important to get used to thinking of these arpeggios as something I use over a chord, so I don’t think of them as substitutions, but just as arpeggios that fit over the chord. I have chosen to use the simplest possible form in my examples so I won’t use any extensions or mix the arpeggio. I think it is a great way to demonstrate how it works. The first example is using the Bb7 and the E7 arpeggio. First the Dm7 line is a basic line built around an Fmaj7 arpeggio. The G7 line is first just a straight Bb7 root position arpeggio followed by an E7 arpeggio that is mixed up a bit more. In the 2nd II V I the Dm7 line is build on an Fmaj7 drop2 voicing that I use as an arpeggio. On the G7 I am using a tritone pair of dominants, which is first a Db7 from the 5th down to the 7th. The same idea is then played on a G7 which fit’s nicely in the melody. The final example starts with an Fmaj7(9) arpeggio and then has a G7 line that mixes the Db7 and Bb7 arpeggios. 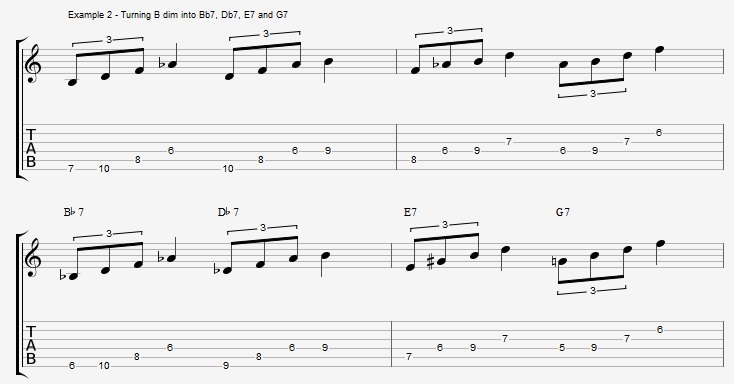 The main idea with the exercises here is to get started using some of these arpeggios when playing over a dom7th chord using the diminished scale. You can always expand on the ideas by starting to add extensions or using some of the other arpeggios from the scale. This entry was posted in Blog, Lesson and tagged arpeggio, diminished scale, dom7th, dominant arpeggios, octatonic on February 23, 2017 by jens.